Oh, wow. Willow had something very similar around 2 months old. That's not at it's worst... at one point it was weepy and crusty and just horrible. 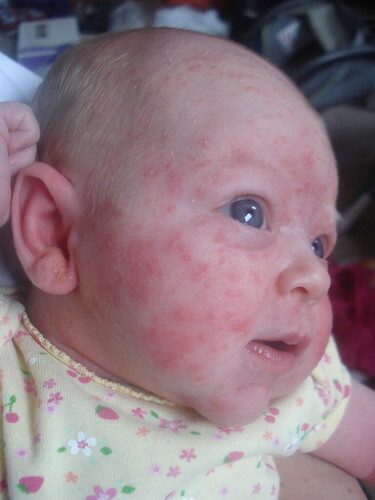 We treated her for eczema which didn't help, but in 3-4 weeks it went away on its own. Hmm. Guess she must have had yeast too, which makes sense because I had thrush while I was pumping on and off. Anyway, hers got better and never bothered her again - so I hope miss Avie and you are feeling better soon. Oh man :( Sorry you guys are dealing with the yeast, I hope it clears up soon. She is adorable, rash or no rash. Sorry you are having to deal with this. Hope it gets better soon! I completely understand. My daughter is allergic to penicillin and broke out with a horrible rash all over her body. I feel bad taking her out because people can be so stupid sometimes! !